Mostly done... is any Jeep really ever done? Woefully behind on the writeups on this page and at Jeep Forum. Life happens. 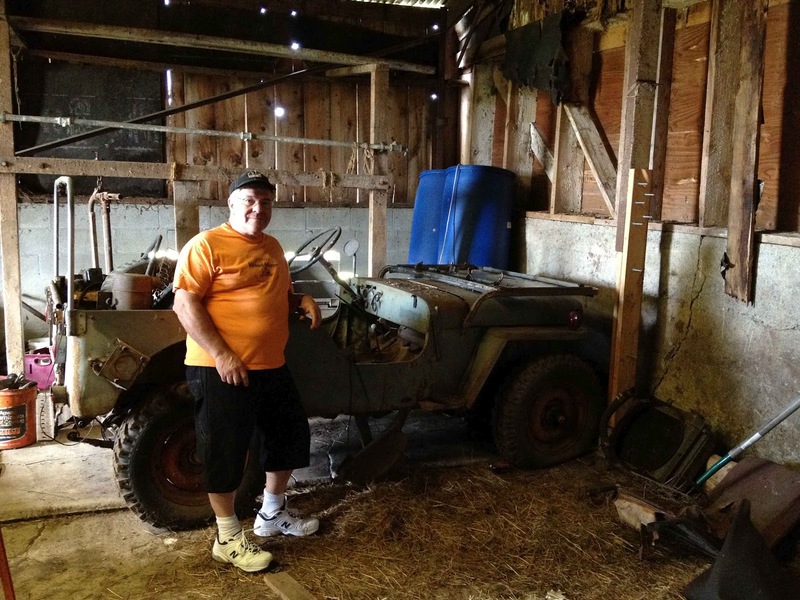 I had heard about this Jeep from a friend who purchased it from a mutual friend's parents. 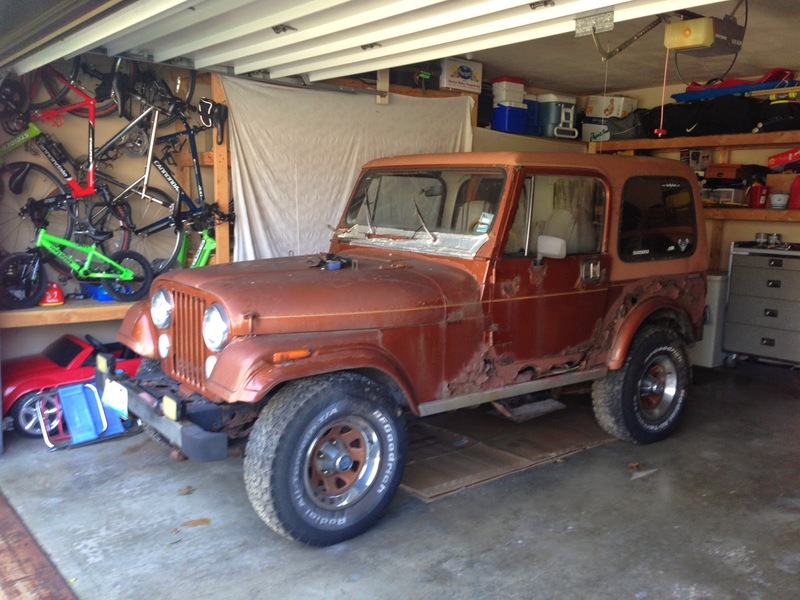 Although this mutual friend knew I was a Jeep guy, I guess she never thought I would be interested in the old CJ7 rotting away up at her parents' farm. So, I never even knew about it until he told me he purchased it. When I heard, I told him that if he ever wanted to sell it, to please let me know. Turned out that he didn't have the time nor the inclination (thanks Terry for the phraseology) to do a rebuild on it since it needed quite a bit of work. I saw it in his garage one day and just shook my head at it. It was a platform that had great potential, but I could see it would need a ton of work. Well, the fellow ended up having to move, and he decided to move one less thing, so I got the call. Here were the pictures he sent. As you can see, there's a whole heap of potential and the risk of a little tetanus too. 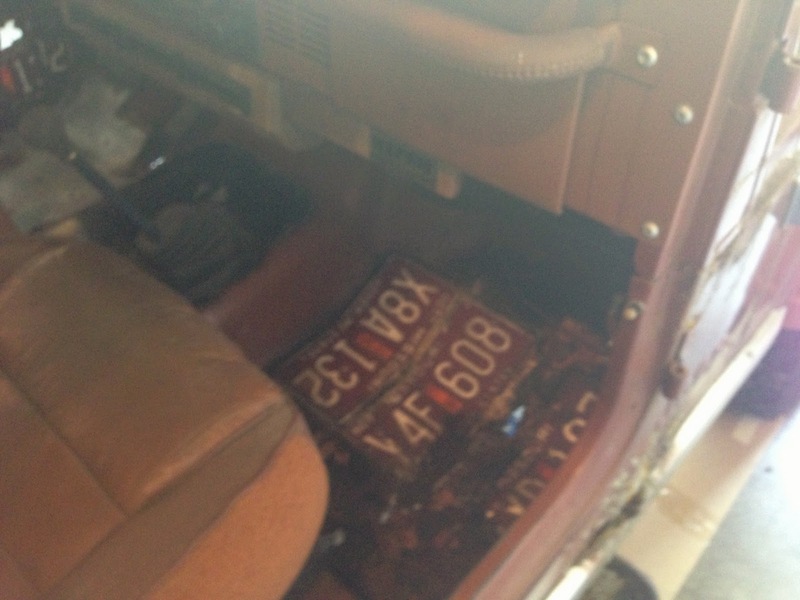 At least I could supplement my license plate collection with some nice crusty vintage maroon Missouri plates! I borrowed a trailer and brought it home with me. The intention was a low-dollar mechanical once-over, and drive it while ignoring the rust, but that didn't end up being what happened. I discovered that one of the reasons he hadn't been able to get it to start was because it wasn't getting any fuel. Turns out that the fuel lines coming from the tank had rusted in half. I picked up a new battery, and checked out the electrics. When they checked out okay, I took a water bottle full of gasoline and attached some new fuel line to the mechanical fuel pump, which I then discovered was leaking. A quick trip to NAPA got a new fuel pump. I just wanted to see if it was going to run before I put another dollar into it. 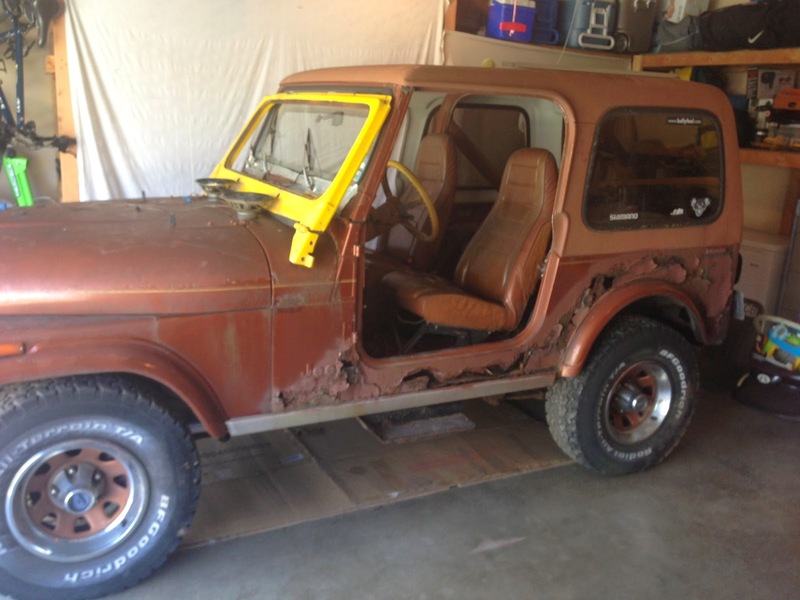 I was already committed to the CJ5 project, and didn't want to get into a second Jeep if it was beyond saving. He'd had it for several months and wasn't even able to get it to start, so I didn't know what I was getting into by purchasing it. I wanted to at least take it for a short drive if possible, and make sure that the transmission shifted well and that the engine ran. Not optional with "redneck fuel tank" system. It's a must. When doing the "redneck fuel cell trick" make sure that you feed the return line back into the bottle, else you won't get far, and you'll surely leave a huge puddle of fresh expensive gasoline behind you in the garage. Don't ask me how I found that out. 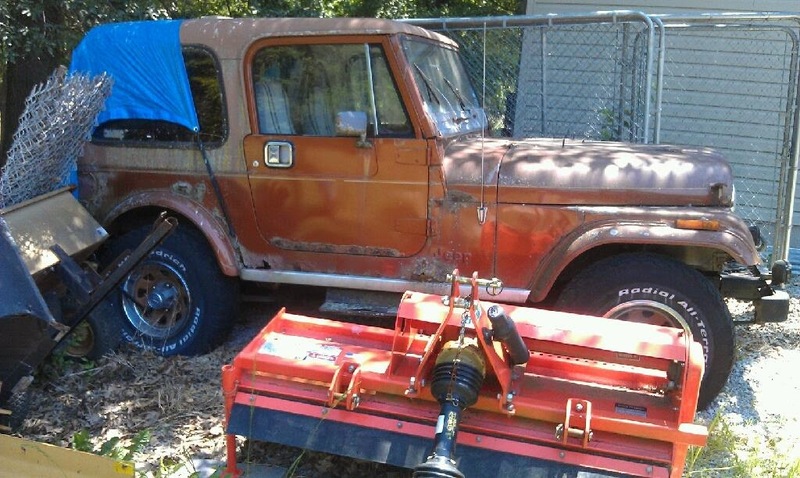 I will be posting this to JeepForum.com as well under this thread: JFab's 1983 Jeep CJ7 Limited Rebuild Thread. The thread might be updated more often than this blog in the hopes that the pictures and info might help others as the forum has helped me in the past. I've been a bit sidetracked on the CJ5 project lately. Have not even posted here for nearly two years. But it's not because I've not been working on Jeeps... I just haven't been doing much to the CJ5. 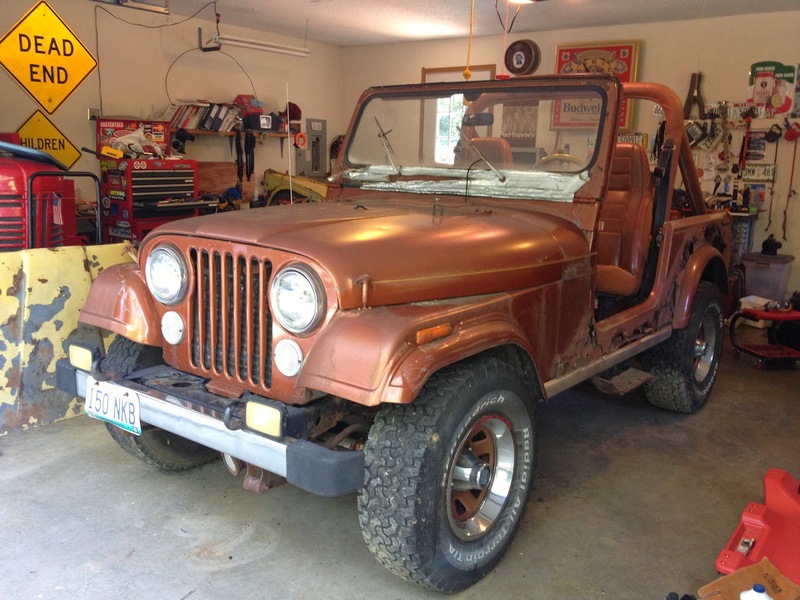 It all started last July when I picked up a 1983 CJ7 "Limited" in need of a tremendous amount of TLC. It has the 4.2L, Auto, Air Conditioning, hard top with factory headliner, color-matched wheels and fender flares, extra sound insulation throughout, and even real leather seats. 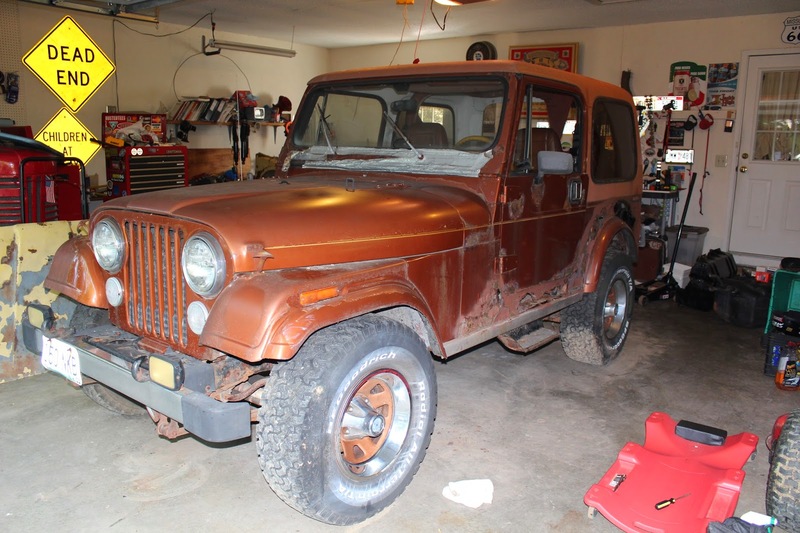 The Limited was a relatively low-production submodel of the CJ7, and they only made them for two years. 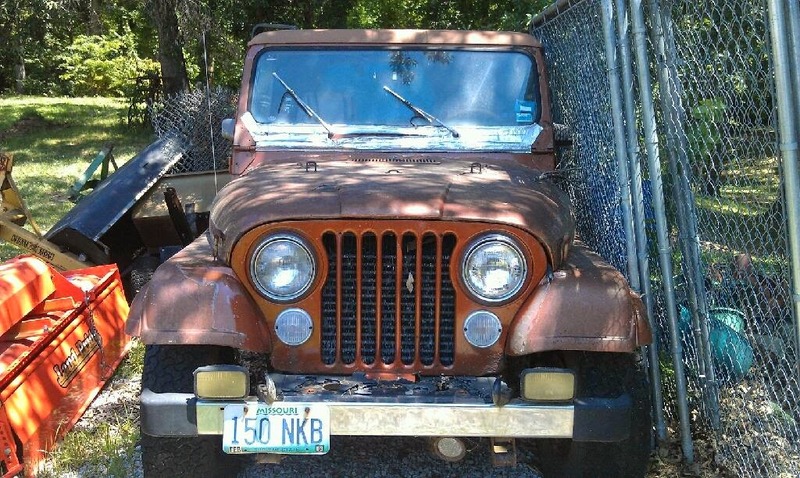 When I came across this one, I hadn't ever even heard of a Limited, and I thought that I knew Jeeps. I thought that the Laredo was the top option package ever offered, and the Limited truly was limited! 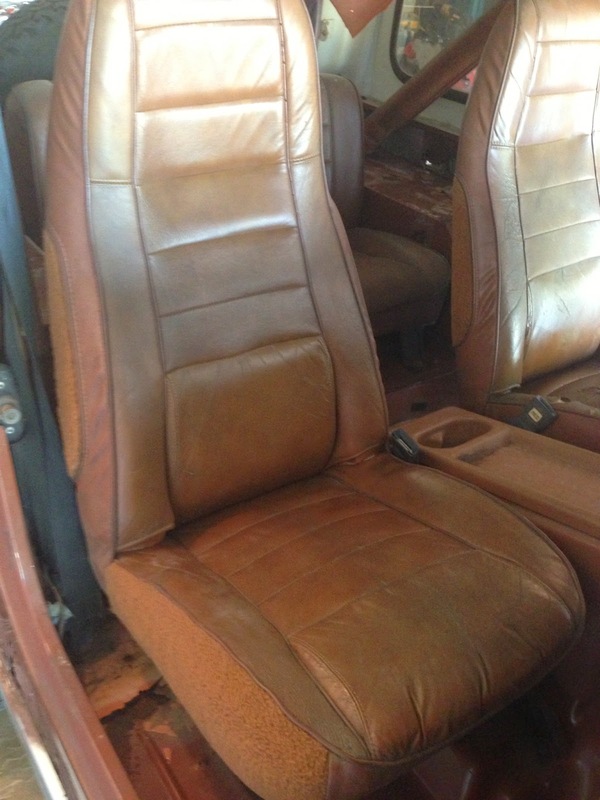 This one had been a Colorado Jeep, and had rust repair over the years, but it was clearly losing the battle. 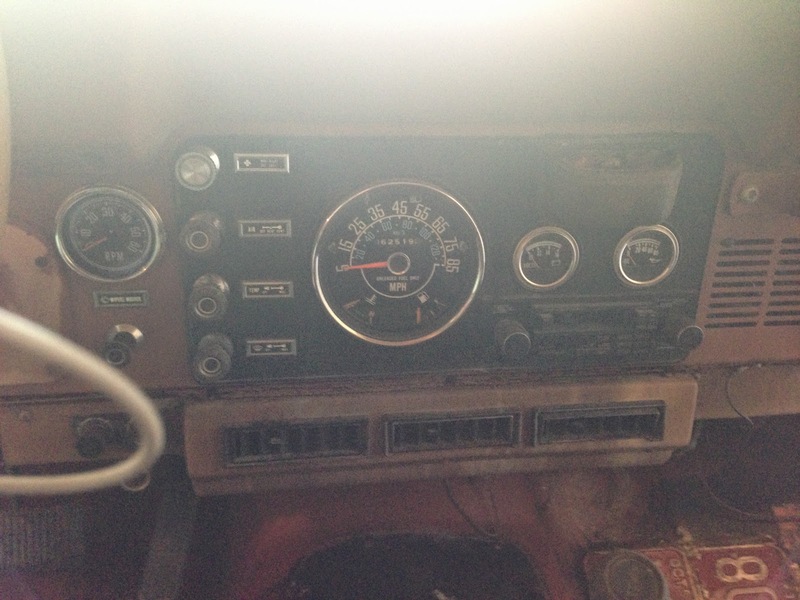 It had been sitting outside for ten years on a farm unused, and I thought it could be a quick-and-dirty, in and out mechanical refresh and just drive the '7, warts and all. 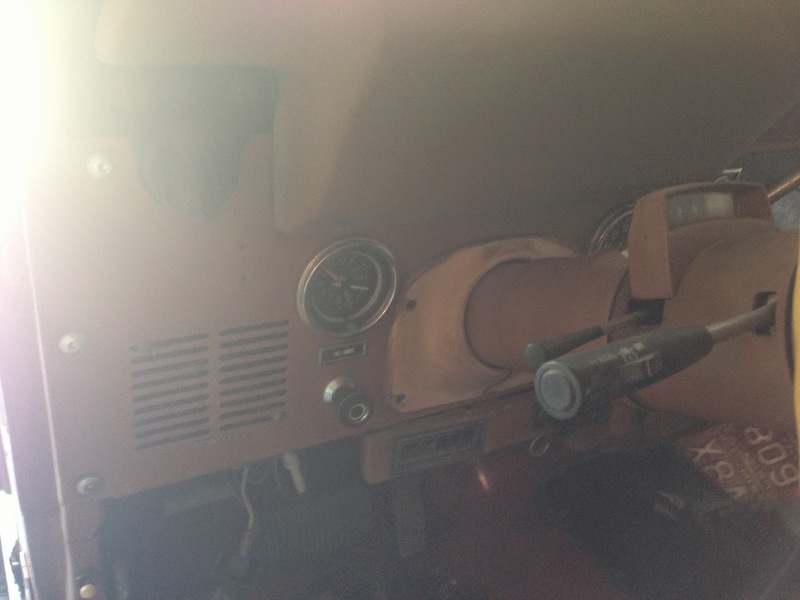 I used to own a 1983 CJ7, with manual everything and a T-4 4 speed. It was the second vehicle I ever owned at age 18, and I loved that Jeep! Though I've owned a few other jeeps, that's one that I really loved, and I was getting a chance to own one again. I couldn't pass it up. I'll start at the beginning, but I need to stop typing this on the iPad. It's taking forever. I'll fill you all in on the goings-on of the last couple of years along the way. Stay tuned for updates. I would like to thank everyone who took the time to vote for us in the 2012 FDIC Battle Of The Bands. We qualified to make the trip to Indianapolis to play at Lucas Oil Stadium for the chance to win $20,000. We are really hoping that we win, because we want to send two children to the IFSA Burn Camp with some of the proceeds. It is quite expensive, but we would really like to help make a difference in a couple of young burn victim's lives. Wish us luck! And, please, take just a moment to "Like" us on Facebook. Visit http://jackshighband.com today! If you've been following along, you know that the body had been sitting on the frame for a short time. So, I asked a couple of guys to come over to lend me a hand getting it off. It was a lot lighter than I thought it would be. Three of us had no issues lifting it up and putting it on my 4x8 utility trailer. I was going to put it on saw horses, but I liked the ability to be able to move the whole mess around. Normally, I would give a few beers to the guys for helping, but since it was 10am, and neither guy drinks beer, I got away cheap. I owe one of my Uncle Terry's soon-to-be-infamous Whiskey Sours to Unvy, though, and some Postum (yuck) to JP. Anyway, it went very smoothly, other than a missed wire to the taillights which we discovered before trying to move the body. You can tilt up each corner and with a helper, determine if there are going to be any bind points or things still connected. The wrong time to find out that you are still attached is when you have the body lifted three feet above the frame! Here are some shots of the "rolling" chassis. "Rolling" is in quotes, because I still have the front wheels off, the results of my attempted brake job. More on that later. The access to the components is amazing, and it should be a pleasure replacing parts as needed now. This is how the Jeeps were assembled in the factory -- as a complete, rolling chassis. The body was added near the end of the assembly line. 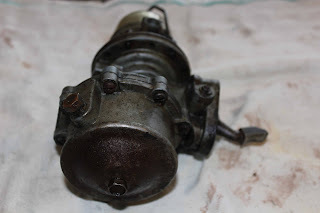 This post should get me to where I actually am in the rebuild project, so all of my "back blogging" will be complete, and the posts will likely come much more infrequently. 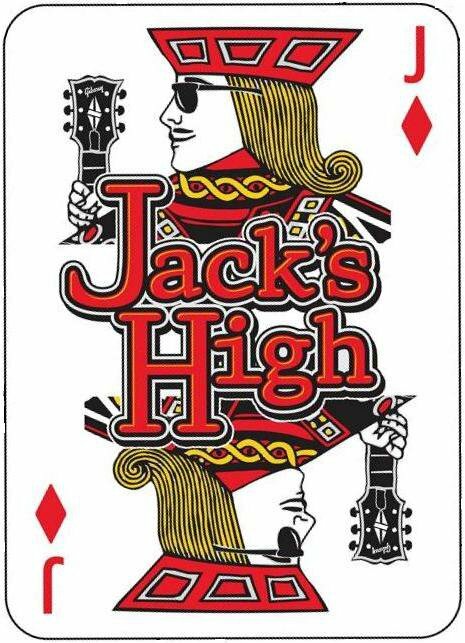 I have been working a lot of overtime at the fire department, working part-time as a bartender/server at The Fifth Quarter, and playing in my band, Jack's High, so wrenching time has dwindled over the last week. However, I have a few guys coming over this weekend to help me lift off the tub. But I am getting ahead of myself. From the factory, early Willys CJ5s had a mechanical fuel pump, whereas modern vehicles have an electric pump. 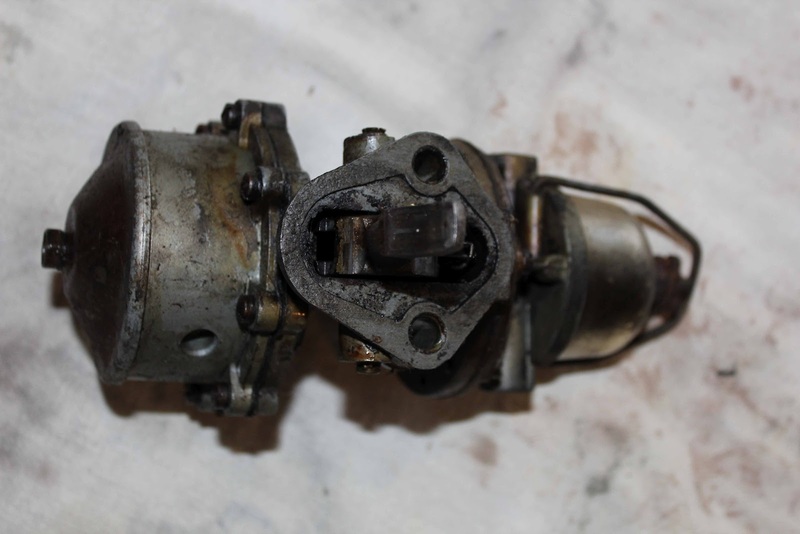 The benefits of the mechanical pump are that if the engine cuts out for whatever reason, the fuel flow immediately stops, whereas an electric pump may keep running, overfilling the carb float and potentially causing an engine bay fire. 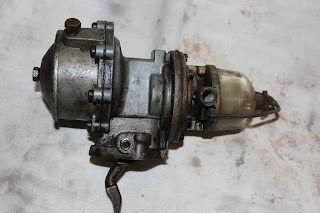 The earliest models had a two-stage pump, in which the top stage pumped fuel, and the bottom stage creates a vacuum in the system to drive vacuum-powered accessories, most notably the wiper on the driver's side. The vacuum-driven wipers can be problematic, as they have a leather flap inside which tends to deteriorate over time if it's not kept lubricated properly. Also, the extra resistance of running a two-stage pump for something that admittedly doesn't run that often (a wiper), made me decide to switch to a later-model one-stage pump and convert the wiper to electric. There were several factors involved in my decision to swap out the pump for a single-stage. The original pump would likely need a rebuild, which cost nearly the amount of a new pump between parts and bench time. Originality was not a concern, either. It felt like a no-brainer to convert to a single-stage. 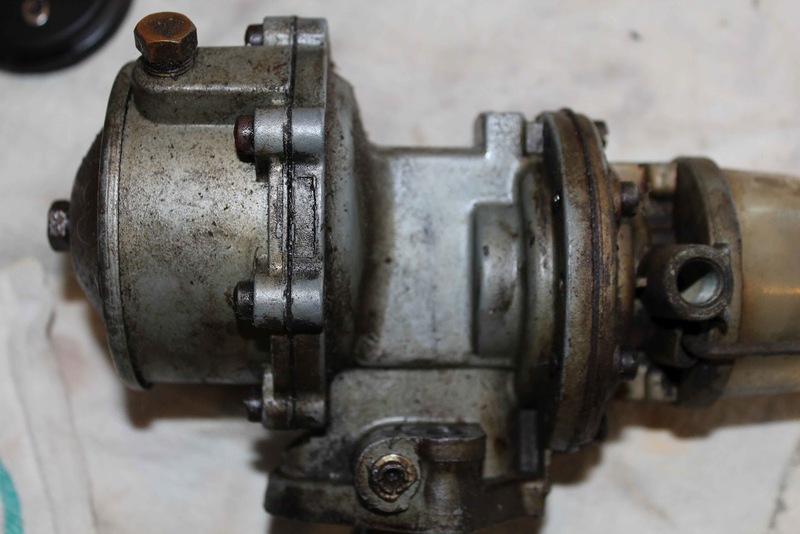 The pump runs by means of a lever which is driven by a concentric on the cam. While it does "rob" a small amount of horsepower, and you don't have a lot to spare with only 74hp from the factory, I thought that the benefits outweighed the disadvantages. After all of those things were accomplished, I tilted the body left to right and front to back on the frame to ensure that I was completely disconnected from the frame. I then removed the windshield and tailgate to save on weight when lifting the body off. When that was done, I decided to remove the roll bar. A few of the bolts snapped off, but that's not a concern at this point, as I am likely to replace the roll bar with a full cage somewhere down the road. So, back to the current state, as mentioned above. I am having a couple of friends over to help me lift the tub off the Willys and put it on a utility trailer I have so that I will have complete access for the mechanical parts of my rebuild project. I'll keep posting as things progress! The first step in taking off a CJ body is the clip removal. There are several small things that you need to do to ensure it comes off smoothly. You can completely unbolt the clip, but like the removal of the tub, you will need a hand to get it off. The first thing that I did was remove the hood. The hinge bolts were only very slightly stubborn, after a quick blast with my new best friend, PB Blaster. Given enough time, it seems that there's nothing PB Blaster can't get unstuck. It eats rust like Pac-Man gobbles pellets. Anyway, this isn't a commercial, but if you're using WD-40, you're missing the boat. Really. Hinges on the parts washer. You can see the original color (orange) here. 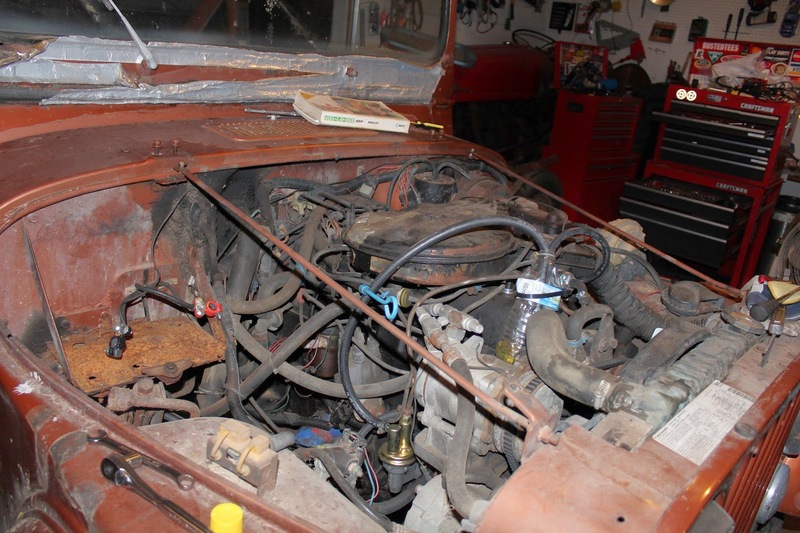 After I disconnected the battery, radiator hoses, grill bolts and hood strut (one's missing), I was ready to examine the wiring on the wiring block. 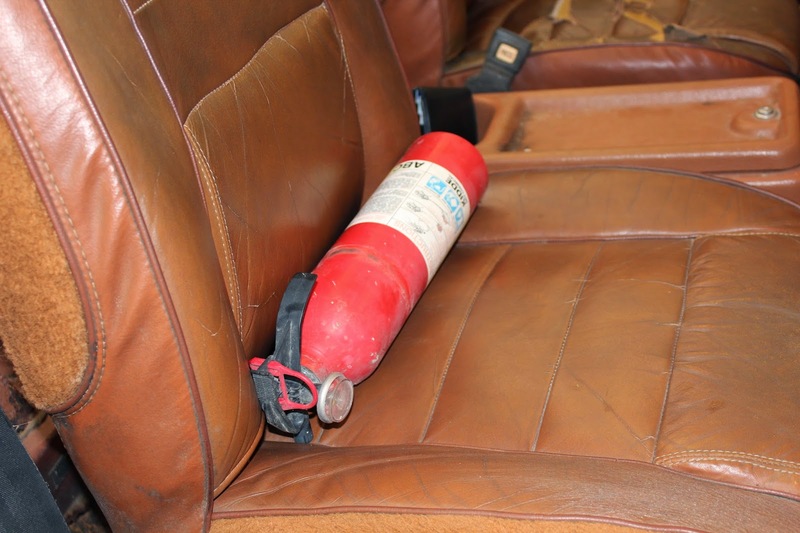 That was an Air Force issued item that my Uncle Terry installed to facilitate removal of the clip. It definitely made things a lot easier, as there were only a couple of things to disconnect, after photographing and carefully labeling with masking tape and a Sharpe, to ensure I can reconnect everything properly. There's a chance that when I go to reassemble this, I will just replace all of the wiring while I am at it, but for the time being, I thought that it would be prudent to treat it as though I was going to retain the original wiring. Wiring Block. Hood strut directly above. After I disconnected all of the wiring, there were some bolts along the side of the clip edges. I removed these, and replaced them in their holes to ensure they wouldn't get lost. I mean, who knows how long it will be until I get everything back together. Speaking of which, you might see some coffee cans in various locations in these photographs. I use a different coffee can for each little subsection of hardware, such as hood mounting hardware, etc. I label the can, throw the lid on it, and the parts stay together and more or less clean (or at least as clean as they were when I pulled them) until I need to reinstall them. I have found that this system works as good as any. 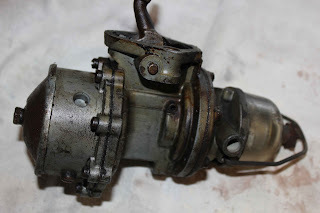 Originally, I thought that I would just take off the clip for better access to the master cylinder and brake lines. However, I was inspired by the ease at which the clip came off, and decided just to pull the whole tub off while I was at it, and just do things right the first time. 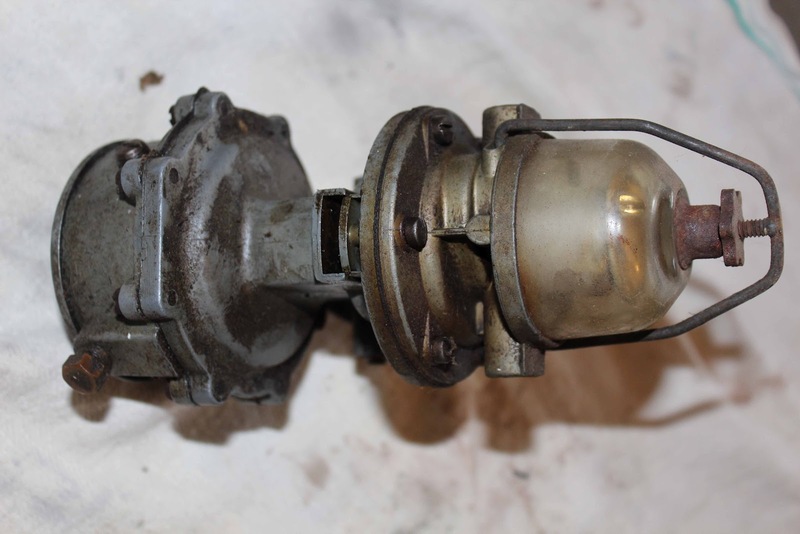 Besides, just removing the clip didn't give me the complete access to the master cylinder, though it did help a bit. Since I have to replace the leaf springs (two are broken) as well as all of the brake lines, and really want to inspect the frame, it seemed like the right thing to do. More later!